Work is beginning on an RWSA meter site on Avon Street, where the Rivanna Trail emerges from under the bridge on the east side of Avon. Access may be closed through the end of the month. While work is underway, Trail users can turn up to the street on the west side of the bridge, cross Avon, and then walk south towards the City yard and the connection to Quarry Park and Rt 20. Matt Kayhoe, former RTF board member and professor at the UVa School of Architecture, passed away this past August. He is remembered as one of the beloved early builders of the Rivanna Trail. Matt regularly participated in work parties, added his architectural expertise to the design of both trails and bridges, and held everyone to high standards of work. In one memorable board meeting he spoke from the heart about the struggle he was having deciding whether or not to allow bicycles on the RTF trails. "I don't like the idea of having bikes on our trails, but when I was a child I had plenty of safe places to ride my bike. For children living in Charlottesville today, riding bikes on streets is not a safe alternative. We must open up our trails to bicycles for the sake of the children." Matt is remembered as a teacher with high, sometimes tough standards, but he was passionate, and he had a heart of gold. We are grateful for his work on the Rivanna Trail. Due to construction of a utility duct, Stribling Avenue Extended will be closed from September 19 to October 14. 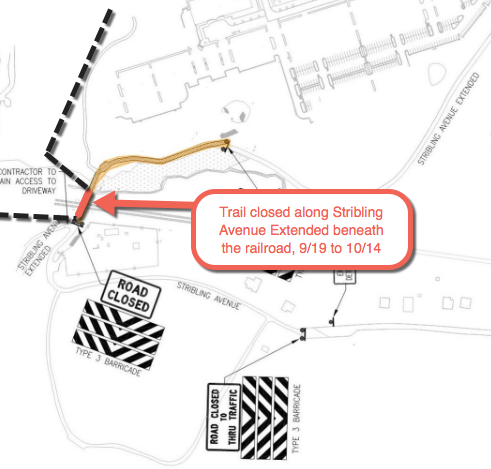 A short stretch of the trail along Stribling where the trail comes out from the Forestry property and passes under the railroad trestle is impacted by this closure. As an alternative, through-hikers may walk along Fontaine, right on Jefferson Park Avenue, and then right again onto Old Lynchburg Road towards Azalea Park. Part of the trail between Avon Street and Quarry Park has closed. While the City pursues a permanent rerouting, a detour is now open that maintains the continuity of the trail. From the former trailhead at Avon Street, follow Avon south and up the hill to the next driveway on the left. Turn onto the driveway and follow the road straight back to a fence where you will find a sign marking a gate, which leads to the detour trail. There are signs with maps posted at either end of the closed section of trail. Please respect the owners of the Virginia Self Storage property and discontinue all use of the previous trail. Doing so will help us maintain our positive relationship with the owners and will aid in future negotiations. I want to personally thank all of you who took the time to reach out to the City councilors and staff to tell them how valuable the RTF trail segment between Avon Street and QuarryPark is to you. Because of your efforts, the City held several meetings with RTF board members to hear our concerns about the loss of this vital section of trail and consider our uncertainties regarding the proposed alternatives. 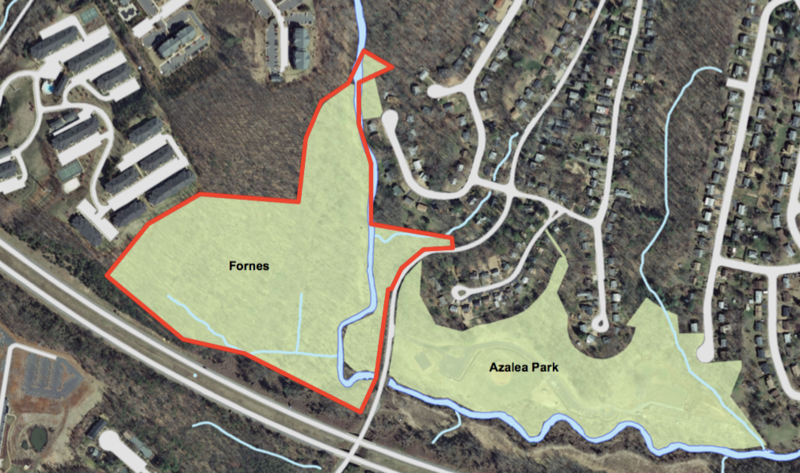 We regret to inform you that, despite our best efforts, the City chose to forgo the agreement with VirginiaSelf Storage, LLC, which would have secured a permanent trail easement and greenway corridor between Avon Street and Quarry Park. Nonetheless, City Council and Staff are instead pursuing an alternative plan, which will potentially re-route the trail onto a narrow strip of land closer to Moore’s Creek, but on the same side of the creek as the current trail. We at the RTF are hopeful that this plan is successful. We will support the City’s efforts to secure the various permissions and easements required and offer volunteer labor to help establish the new trail corridor. In the meantime, the City has generously opened a detour that will maintain the continuity of the trail. From the former trailhead at Avon Street, follow Avon Street south and up the hill until you come to the next driveway on your left. Turn left onto the driveway and follow the road straight back to a fence where you will find a sign marking a gate, which leads to the detour trail. There are signs with maps posted at either end of the closed section of trail. Thank you again for your ongoing support of our urban trail system. The RTF has been awarded a $10,500 grant from Dominion Resources to build an upgraded crossing under the 250 Bypass near Hydraulic Road. RTF was one of 61 environmental organizations across ten states that shared $1 million. We have some concrete lintels through there now, but they’re subject to damage from high water, expensive to maintain--and back-breaking work to replace when needed (the photo at right is from our last repair project). The grant enables us to partner with the City to build a permanent raised walkway, high enough that it is above the normal water level, but low enough that heavy water and debris will be able to pass over it unobstructed during storms. This is but the latest example of support from Dominion; in the past they’ve provided telephone poles for bridge projects, volunteer work crews, and an easement along their Hydraulic Road property. 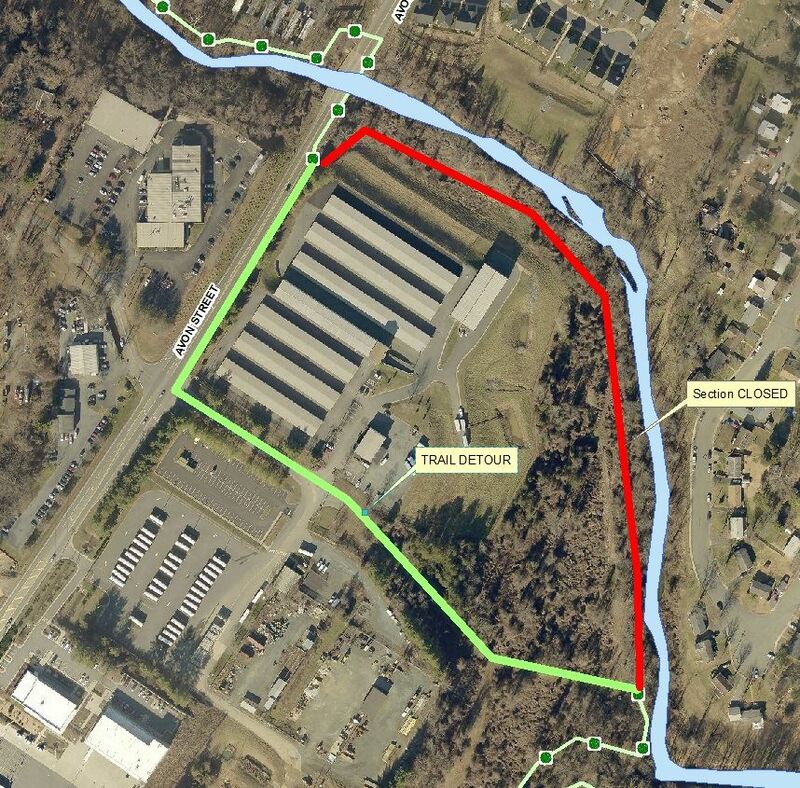 The City of Charlotesville has finalized property purchase and easements along the west side of Moores Creek, which will allow for a new connection between Sunset Road and Old Lynchburg Road. This provides a permanent trail to Azalea Park, replacing the former RT route on the opposite side of the creek that was closed a couple of years ago. Some temporary markers are already in place, but improvements and signage will come later in the year. This new property, coupled with an easement from the Eagles Landing apartments, will close a major gap in the Trail though southwest Charlottesville. 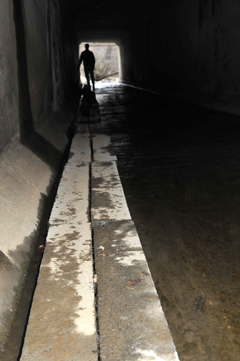 Sections of the Rivanna Trail near the railroad in Greenbrier Neighborhood will be closed from April 4th - May 7th for necessary repairs to the Meadow Creek Interceptor sewer system. Twenty-four years ago, a group of Charlottesville residents had a vision. They shared a deep appreciation of nature, the desire to explore the hidden wild places within our urban landscape, and an idea for a trail that followed our local waterways and encircled our city. The current board members of RTF are proud to carry on the vision of those founding members as the trail and the organization continue to grow. Whether you are a trail user, a property owner, a one-time volunteer, or a trail adopter, you know the value that RTF brings to our community. We are currently looking for people like you who may be interested in serving on the RTF Board of Directors. Board members meet once monthly, lead or co-lead at least one trail workday per year, serve as advocates for trail use and development, and guide the evolving vision of the organization. Previous non-profit board experience is a plus, but enthusiasm for our local trails is the primary qualification. Some of us are naturalists who use the trails to immerse ourselves in the beauty of our native flora and fauna, others are active hikers, runners, and cyclists; and many are all of the above. Whatever draws you outdoors and into our urban wild places, we all rely on the trails that connect our community. Please contact us if you or someone you know are interested in becoming more involved, and thank you for your support of our local trails! The City of Charlottesville will be posting a job soon for a seasonal (March-October) trail position. Interested candidates should contact Chris Gensic (gensic@charlottesville.org), the City's Park & Trail Planner, or watch the City job board (http://agency.governmentjobs.com/charlottesville/default.cfm). Candidates have to be 18 and should have some experience in trail work.